For $75 a month, you could rent a Capitol Hill apartment across the street from the magnificent Thomas Jefferson Building in a quiet neighborhood with tree-lined brick sidewalks, broad alleys and neighbors who could be laborers, lawyers or congressmen. At least, you could 60 years ago. 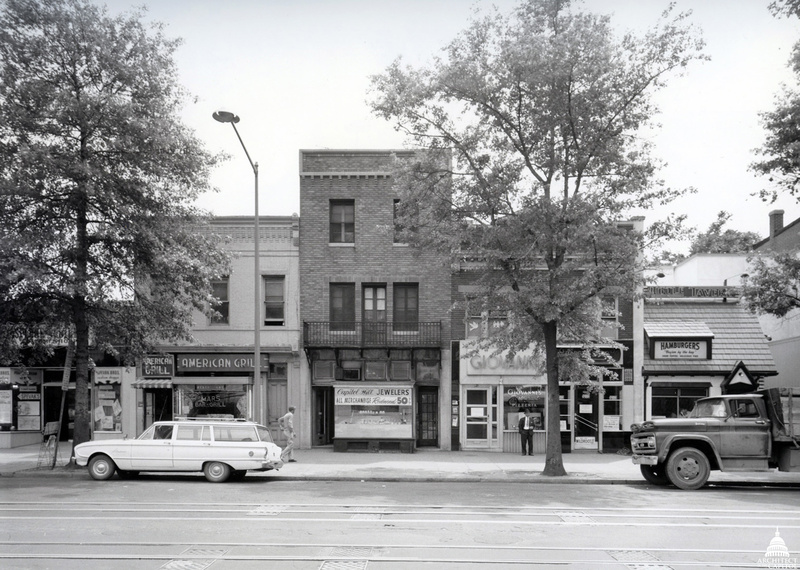 A view of the block where the Madison Building now stands. At that time, you would find cobbler shops, doctors’ offices and restaurants, like the Little Tavern, famous for its five-cent hamburgers. Recalling that time, a cobbler’s granddaughter remembered looking down on the staging area for inauguration parades from the iron balcony outside her grandparents’ house above their store. For 25 cents a week, you could have a paperboy deliver the Times-Herald twice daily — Times in the evening, Herald in the morning. As the years passed and the neighborhood developed, your paperboy, Jerre Ness, would grow up to work for the Architect of the Capitol as a supervisor during construction of the new Library of Congress building on the block across from the Jefferson Building that once held apartments, shops and restaurants. That building is the James Madison Memorial Building, the largest library structure in the world, containing 1.5 million square feet of space. In addition, the Madison Building is the nation's memorial to the father of the U.S. Constitution and the Bill of Rights and the fourth president of the United States. One original plan for the Madison Building had it in another location, wrapped around a historic church. Original plans were for a separate memorial to occupy the block the building now sits on. The library building, housing the ever-expanding collection of newspapers, magazines and books, would be located farther east, on a block containing the historic St. Mark's Episcopal Church. Initial drawings show that the church would be preserved, with the library building wrapped around it. The memorial is shown as a simple classical building with Corinthian porticoes on each of its sides surrounded by a large park. 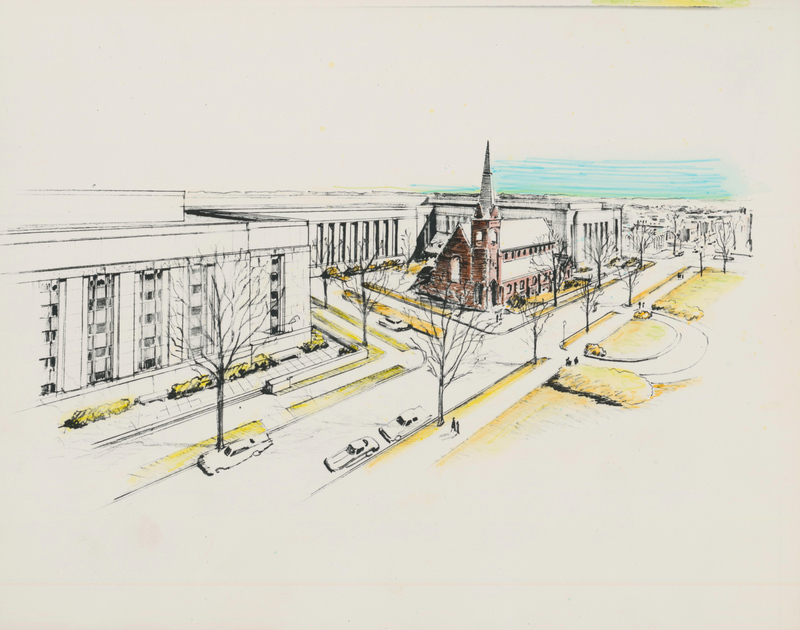 The final design, however, placed a memorial hall with a monumental statue of Madison within the building, allowing construction to begin immediately, saving time and money and preserving more of the historic Capitol Hill neighborhood. 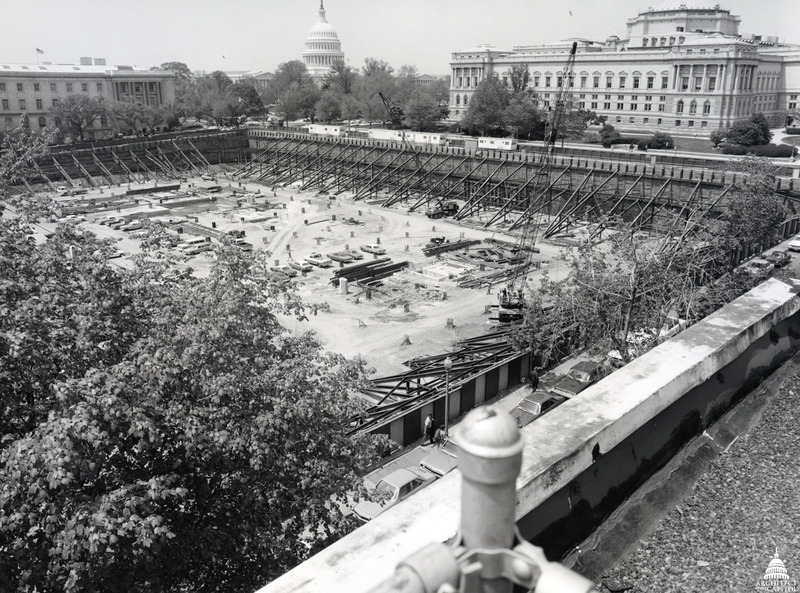 The Madison Building opened its doors in 1980, enabling the Library of Congress to expand its work to protect and preserve our nation’s cultural treasures. Fitting, then, that the spacious new building was designed by the architecture firm of Roscoe DeWitt, who himself preserved the treasures of Europe while under enemy fire during World War II, as a Monuments Man. His comrade in arts, another Monuments Man, Walker K. Hancock, sculpted the statue of Madison that resides just behind the colonnade in a memorial alcove. Madison considered the preservation of knowledge essential to democracies and, in 1783, foresaw the founding of the library by proposing a list of books that would be useful to legislators. He wrote that, "A people who mean to be their own governors must arm themselves with the power which knowledge gives." This is inscribed at the entrance to the Madison Building, which continues to honor his legacy by arming people with knowledge that empowers them to preserve the democracy he helped design. Cool! I work in the Madison building so love knowing this bit of history. A couple of years ago a visited the Madison building for business reasons. I never got to know its history, now it is nice to know so much about it.